Volvo introduced the 850 in 1991 with the GLT sedan. In the years to follow came the GLE, the Estate and the Turbo. Volvo Management was continuously searching for new ways of placing the 850 in the spotlight. In 1994 The Marketing Department announced two new plans. The first was getting “back on track” with the Volvo 850 in the British racing competition; the BTCC. The other new product was a special version of the 850 Turbo. This last product became known as the Volvo 850 T-5R. The project team only got 9 months and a budget of 15 mln Swedish Krones to come up with something special. They dressed up a standard T-5 with accessories they already had on the shelves. Fitted 17 inch rims with sporty looks, lowered suspension and thanks to Volvo’s colourguy Ingvar Malander they came up with a complete new color. Cream Yellow. The projectgroup was aware of the fact that people were not just waiting for a sporty looking turbo with a funny color, but also expected special performance. 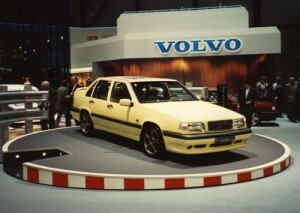 Early march 1994, at the Salon of Geneva, Volvo could present a Cream Yellow sedan, With an engine that had slightly more power than the standard T-5. The car was introduced as the T plus 5. In the months following the introduction the team had to work on the colors. It would be a limited range of cars and producing only yellow ones could be a certain risk. They also came up with black, grey, amaretto and even pearl white ones. 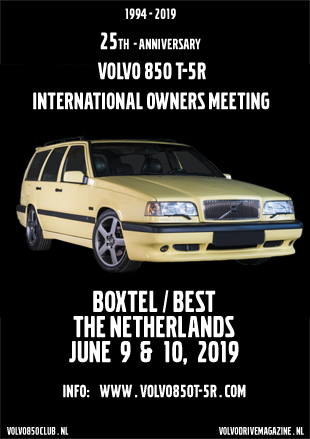 In the meantime the marketing department dressed up a sedan and an estate in cream yellow and started producing pictures for press-releases and for the brochures to come. They also shot a movie. All of this happened in the yellow rapeseed fields in Skåne in the south of Sweden. The rapeseedfields are yellow between half of may and half of June. When the pictures and the movie were made, the development was still in progress. The interior wasn’t finished yet. That was the reason why the two cars that were used for pictures and the movie had tinted windows. One can guess why the headlight wipers were missing on these cars. The introduction car in Geneva had them already. Since certain parts of the movie and certain images contain close-ups of the alcantara interior one can conclude that those images were shot later that year. The B5234T engine used in the T-5 (with motorcode 57) was slightly adapted for the T-5R. It became the B5234T5 with motorcode 58. The adaption was at least in the ECU software to get more power and torque. In the Swedish license registration history can be found which cars with enginecode 58 are registered in 1994. The early ones (before July 1994) were projectcars registered as regular Turbo’s MY94. 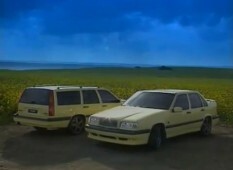 On July, 15th there were registered two cream yellow cars, a sedan and an estate, as regular T-5R’s. Those two are the oldest T-5R’s which are registered as a T-5R. Both cars still exist and are somewhere around in Sweden. After the summer, at the 11th of August 1994 there were registered around 20 sedans and 20 estates as T-5R’s with the Swedish registration office. Most of those cars were Cream Yellow. Only three of the estates and three of the sedans were black and also one of the estates and one of the sedans was white. The other colors that were used before, didn’t make it for these pre-production series cars. I guess that these pre-production cars were used for advertisement purposes and for the press. When the final decision about the colors had to be made, the verdict was that only yellow ones could be ordered. No black ones and the white ones (pearl white), initially meant for the USA market, didn’t make it neither. They discovered that the painting process for this color was too expensive. A lot of the pre-production cars are still around somewhere. This white sedan used to be owned by Volvo for a long time, but at the end it was sold to someone near Gothenburg. It still has the T-5R identification, but not the T-5R trim. Only the pearl white color could reveal its true identity. It is unknown where the white estate from the pre-production currently is registered. From all over the world Volvo dealers started to order the yellow cars. The demand was overwhelming. They also demanded a not-so-yellow car. There were clients who wanted to have something special, like a T-5R, but not in such a fancy color. Short for production start Volvo decided to extend the limited series from 2500 yellow cars with 2500 black cars. In week 40 of 1994 (the first week of October) the production of T-5R’s starts in the factory in Gent, Belgium. From mid October cars were available in several countries. In Italy, due to tax-regulations, the T-5R only became available with the 2.0 liter engine (motorcode 47). All other countries had the 2.3 liter engine. Some of the countries didn’t get both colors. For example: Norway only sold yellow cars and Portugal only sold black ones. The car was a huge success. Early January 1995 the complete limited series was sold out. 2500 Yellow cars and 2500 Black cars. Volvo dealers still noted a demand for this special car. Eventually Volvo started producing a second series of T-5R’s. Part MY95 (760 cars) and part MY96 (1150 cars). The green ones were not sold in all countries. For example, Sweden, Finland, Switzerland and Canada didn’t offer the green ones. In the USA only 13 green estates were sold. The rarest T-5R is a green sedan. Only 329 were produced. The green estate has the highest production number. 1582 cars. Most of them sold in Italy and Germany, But also a lot of those went to Japan, the UK and the Netherlands.